Objective To evaluate the diagnostic accuracy of high-risk human papillomavirus (hrHPV) assays on self samples and the efficacy of self sampling strategies to reach underscreened women. Data sources Medline (PubMed), Embase, and CENTRAL from 1 January 2013 to 15 April 2018 (accuracy review), and 1 January 2014 to 15 April 2018 (participation review). Review methods Accuracy review: hrHPV assay on a vaginal self sample and a clinician sample; and verification of the presence of cervical intraepithelial neoplasia grade 2 or worse (CIN2+) by colposcopy and biopsy in all enrolled women or in women with positive tests. Participation review: study population included women who were irregularly or never screened; women in the self sampling arm (intervention arm) were invited to collect a self sample for hrHPV testing; women in the control arm were invited or reminded to undergo a screening test on a clinician sample; participation in both arms was documented; and a population minimum of 400 women. Results 56 accuracy studies and 25 participation trials were included. hrHPV assays based on polymerase chain reaction were as sensitive on self samples as on clinician samples to detect CIN2+ or CIN3+ (pooled ratio 0.99, 95% confidence interval 0.97 to 1.02). However, hrHPV assays based on signal amplification were less sensitive on self samples (pooled ratio 0.85, 95% confidence interval 0.80 to 0.89). The specificity to exclude CIN2+ was 2% or 4% lower on self samples than on clinician samples, for hrHPV assays based on polymerase chain reaction or signal amplification, respectively. Mailing self sample kits to the woman’s home address generated higher response rates to have a sample taken by a clinician than invitation or reminder letters (pooled relative participation in intention-to-treat-analysis of 2.33, 95% confidence interval 1.86 to 2.91). Opt-in strategies where women had to request a self sampling kit were generally not more effective than invitation letters (relative participation of 1.22, 95% confidence interval 0.93 to 1.61). Direct offer of self sampling devices to women in communities that were underscreened generated high participation rates (>75%). Substantial interstudy heterogeneity was noted (I2>95%). Conclusions When used with hrHPV assays based on polymerase chain reaction, testing on self samples was similarly accurate as on clinician samples. Offering self sampling kits generally is more effective in reaching underscreened women than sending invitations. However, since response rates are highly variable among settings, pilots should be set up before regional or national roll out of self sampling strategies. The previous accuracy meta-analysis concluded that hrHPV testing was less sensitive on self samples than on clinician samples, but also found that the reason for lower sensitivity was the use of assays based on signal amplification.22 In this review, we separately pooled the accuracy of hrHPV assays based on signal amplification from hrHPV assays based on polymerase chain reaction. We also included subgroup meta-analyses and multivariable analyses assessing the variation in hrHPV testing accuracy on self samples by assay, self sampling device, and storage medium. The first meta-analysis included diagnostic test accuracy studies that answered the following questions: what is the relative accuracy a hrHPV assay on a self sample compared with a clinician sample; and does the relative accuracy vary by clinical setting (screening population, high-risk population, follow-up for previous abnormalities, and monitoring after treatment), assay, self sampling device, and storage medium? We distinguished hrHPV assays based on a principle of signal amplification from hrHPV assays based on polymerase chain reaction and included only assays that were clinically validated for cervical cancer screening on clinician samples.28 However, we also performed more comprehensive analyses that included non-clinically validated assays (supplementary materials). The targeted disease was cervical intraepithelial neoplasia grade 2 or worse (CIN2+) and CIN3+. The second meta-analysis included randomized clinical trials and aimed to answer whether offering self sampling kits to women who were underscreened generated higher response rates than sending invitation or reminder letters. Secondary outcomes were test positivity rates, adherence to follow-up in women who were screened, and detection of CIN2+. Diagnostic studies for the accuracy review were eligible if the following criteria were met: a vaginal sample was collected by a woman herself (self sample) followed by a cervical sample collected by a clinician (clinician sample); the same hrHPV assay was performed on both samples; and the presence or absence of CIN2+ was verified by colposcopy and biopsy in all enrolled women, or in women with one or more positive tests. Studies with cytological follow-up for women with negative colposcopy results at baseline assessment were accepted as well, but were indexed for sensitivity analyses. Randomized clinical trials for the participation review were eligible if the following criteria were met: the study population involved women who were irregularly screened, never screened, or did not respond to invitation or reminder letters for conventional screening for cervical cancer; women in the intervention group (self sampling arm) were invited to collect a self sample for hrHPV testing; women in the control arm were invited or reminded to undergo conventional cytology screening or hrHPV testing, or both, on a sample taken by a clinician; participation in the self sampling arm and the control arm was documented; and a minimum of 400 women were included in the study. In the per protocol analyses of randomized clinical trials, only women who took a self sample in the experimental arm were counted. In the intention-to-treat analyses, which reflected the overall public health effect in a real world situation, we additionally included women in the experimental arm who had been offered self sampling but choose to have a clinician sample taken instead. We included the following invitation scenarios: mail-to-all, opt-in, community campaign, and door-to-door. In mail-to-all studies, self sampling kits were mailed directly to a woman’s home address for her to return by mail or in person to a local clinic. In opt-in studies, women had to request a self sampling kit. Community campaigns included community supported actions and outreach supported by mass media. In door-to-door interventions, community health workers delivered self sampling kits to women’s homes or workplaces. Given the intrinsic strategic differences, participation rates were pooled separately by invitational scenario. Statistical significance was defined as P<0.05. We used STATA/SE 14 (STATA Corp, College Station, TX) for statistical analyses, except for the bivariate normal model, which was run in SAS 9.3 (SAS Institute Inc, Cary, NC). Since the meta-analyses only included published reports, no patients were involved in setting the research question or the outcome measures, nor were they involved in developing plans for design or implementation of the study. No patients were asked to advise on interpretation or writing up of results. There are no plans to disseminate the results of the research to study participants or the relevant patient community. It was not evaluated whether the studies included in the review had any patient involvement. This update contains 19 new reports containing 22 diagnostic studies and nine new randomized participation trials, 26434445464748495051525354555657585960616263646566676869 which were added to the 34 accuracy studies and to the 16 participation trials already included in the previous meta-analyses.707172737475767778798081828384858687888990919293949596979899100101102103104105106107108109110111112113114115116117 The updated meta-analyses finally comprised 56 diagnostic test accuracy studies and 25 randomized trials. The PRISMA flowcharts and study characteristics are available in the supplementary materials. The risk of bias for enrolment of women was considered low in 59%, moderate in 39%, and high in 2% of the 56 diagnostic studies (supplementary materials). Reporting and execution of tests (description of cut-off, blinding of the index test toward comparator and reference test) was adequate in 73% and unclear in 27%, but the risk of bias was never assessed as high. The quality of verification with a reference standard (acceptable validity, blinding toward tests, and avoidance of incorporating test results in final conclusion of disease outcome) was good in 84%, moderate in 13%, and problematic in 4% of the studies. The delay between self sampling, clinician sampling, and verification with the reference standard was short in 61%, unreported in 38%, and long in 2% of the studies. Partial verification was avoided in 70% but clearly present in 25%, whereas differential verification was absent in 89% but unclear or present in 11% of the studies. Withdrawal of patients was explained appropriately in 70%, but not in 18%, and unclear in 12% of the studies. In most papers, uninterpretable results were poorly reported for the evaluated tests and for the reference standard (39% and 45%, respectively). Three (12%) of the 25 trials met the criteria for low risk of bias in all categories.114115117 In eight trials (32%) allocation was random and concealed,26636465104114115117 in 14 trials (56%) allocation was unclear,6667102103105106107108109110111112113116 and in three trials (12%) allocation was problematic.626869 All trials had complete data for the participation outcome and were therefore at low risk of attrition bias. The quality of reporting was adequate in 12 trials (48%),2667102103104107108109114115116117118 incomplete in one trial,106 and intermediate in the other trials. The pooled absolute sensitivity and specificity for outcomes CIN2+ and CIN3+, varied substantially by clinical setting and, therefore, accuracy measures were pooled separately by setting. Figure 1 shows that in screening studies, the pooled absolute sensitivity of hrHPV assays for CIN2+ based on signal amplification was substantially lower in self samples (77%, 95% confidence interval 69% to 82%) than in clinician samples (93%, 89% to 96%). The pooled absolute specificity to exclude CIN2+ was 84% (95% confidence interval 77% to 88%) in self samples and 86% (81% to 90%) in clinician samples. The pooled absolute sensitivity of hrHPV assays for CIN2+ based on polymerase chain reactions was 96% for both self samples and clinician samples. The specificity to exclude CIN2+ was similar for both self samples and clinician samples (79%). Supplementary table 10 shows the pooled absolute accuracy values for all clinical settings (screening population, high-risk population, follow-up for previous abnormalities, and monitoring after treatment). The absolute specificity of all hrHPV assays on self samples and clinician samples was substantially lower in the other clinical settings than with screening. The relative accuracy of hrHPV assays on self samples versus clinician samples did not vary substantially by clinical setting and therefore we could estimate overall relative sensitivity and specificity under the condition to separate hrHPV assays based on signal amplification from hrHPV assays based on validated polymerase chain reaction. Table 1 shows that hrHPV assays based on signal amplification were less sensitive (ratio 0.85, 95% confidence interval 0.80 to 0.89 for CIN2+; 0.86, 0.76 to 0.98 for CIN3+) and less specific (0.96, 0.93 to 0.98 to exclude CIN2+) on self samples versus clinician samples. The test positivity rate was, on average, 14% higher and the positive predictive value was significantly lower for both CIN2+ and CIN3+ for self samples (positive predictive value< 1). hrHPV assays based on polymerase chain reaction were equally sensitive (ratio 0.99, 95% confidence interval 0.97 to 1.02 for CIN2+; 0.99, 0.96 to 1.02 for CIN3+) and slightly less specific (0.98, 0.97 to 0.99 to exclude CIN2+) on self samples versus clinician samples (table 1 and supplementary figs 3-6). The test positivity rate was similar in self samples versus clinician samples. Table 1 shows that the positive predictive values for CIN2+ or CIN3+ were not significantly lower for self samples. Supplementary table 11 shows the pooled relative sensitivity and specificity for individual hrHPV assays for CIN2+ on self samples versus clinician samples. Each hrHPV assay based on signal amplification (HC2, careHPV, and Cervista) as well as the hrHPV E6/E7 mRNA test with APTIMA were at least 15% less sensitive for CIN2+ on self samples versus clinician samples. Each hrHPV assay based on polymerase chain reaction was equally sensitive for CIN2+ and for CIN3+ on self samples versus clinician samples. Table 2 shows that the pooled sensitivity of hrHPV assays based on signal amplification was 10% to 16% lower on a self sample versus a clinician sample for all self sampling device and storage medium categories. Table 2 shows that the pooled sensitivity of hrHPV assays based on polymerase chain reaction on a self sample was similar (the 95% confidence interval for the ratio included unity) to a clinician sample for all of the self sampling devices and storage media. In general, hrHPV assays were less specific on self samples except for the HC2 assay on a tampon self sample (n=1) or an assay based on polymerase chain reaction on a vaginal lavage self sample (2). All hrHPV assays were less specific on self samples stored in cell preserving media (9) or virological media (18). Pooled relative accuracy data for each self sampling device and storage medium can be found in supplementary tables 12 and 13. No important patterns in the relation between the accuracy and QUADAS items or small study effects could be discerned (supplementary materials). However, in screening studies, where partial verification bias was avoided, the specificity of the hrHPV assay based on signal amplification on self samples was significantly lower (83%) than in studies where verification was not avoided or unclear (87%; P=0.03). Table 3 and supplementary figure 9 show that the percentage of women in the self sampling arm that had a hrHPV test done on a self sample, when the self sampling kit was mailed to a woman’s home (mail-to-all), varied in the per protocol analysis between 6.4% and 34.0%, with a pooled average of 19.2% (95% confidence interval 15.7% to 23.0%). The pooled participation rate was 7.8% (95% confidence interval 5.2% to 10.9%) when women had to request a self sampling kit (opt-in), 15.6% (12.4% to 19.5%) in one trial where women were invited through community campaigns, and 94.2% (80.2% to 100.0%) when community health workers delivered self sample kits directly to women’s homes or workplaces (door-to-door). In the trials in which additional Pap tests were reported in the mail-to-all group (intention-to-treat analysis), the overall participation rate was slightly or substantially higher, ranging from 10.2% to 39.0%, with an average rate of 24.8% (21.6% to 28.1%). The pooled percentage of participating women, in the intention-to-treat analysis of the self sampling arm, was 17.7% (12.3% to 23.9%) in the opt-in scenario and 94.6% (83.0 to 99.9%) in the door-to-door scenario. Table 3 and supplementary figure 10 show that the average percentage of women who participated in the control arm was 11.5% (95% confidence interval 8.3% to 15.1%) in the mail-to-all scenario, 13.4% (10.2% to 16.9%) in the opt-in scenario, 6.0% (4.2% to 8.7%) in the community campaigns scenario, and 53.3% (10.5% to 93.2%) in the door-to-door scenario. By default, the participation rates in the control arm were the same in the intention-to-treat analysis. In two Italian studies,104117 there were groups of women who were offered hrHPV testing on clinician samples in the control arm. The participation was not significantly different when hrHPV testing was performed versus when cytology was performed (P=0.60 v P=0.76).104117 In the Belgian randomized clinical trial,69 two control arms were included: one where the usual reminder letter was sent to non-responders and another one where no letter was sent to non-responders. In the first control arm (reminder letter) the response rate was 10.5% (95% confidence interval 9.9% to 11.2%), whereas in the second control arm (no letter), the response rate was slightly lower (8.0%, 95% confidence interval 7.5% to 8.6%). Table 3 and figure 2 show that in the per protocol analysis of the mail-to-all scenario, the pooled participation difference was 7.3% (95% confidence interval 4.1% to 10.6%, I2=99%). The participation difference was nearly always positive except for two studies where the difference was significantly lower than zero. In the opt-in scenario, the pooled difference tended to be negative in several studies and was also lower than zero when trials were pooled (participation difference −5.1%, 95% confidence interval −10.0% to −0.2%). In the community campaign, the participation difference was 9.5% (95% confidence interval 5.4% to 13.7%), whereas in the door-to-door scenario the pooled difference was 39.7% (95% confidence interval 4.0% to 75.4%, range 11% to 64%, I2=99.9%). In the intention-to-treat analysis of the mail-to-all scenario, the pooled participation difference was 12.8% (95% confidence interval 10.4% to 15.1%, range 5% to 30%, I2=97%), whereas in the opt-in scenario the difference was not significantly different from zero (participation difference 3.3%, 95% confidence interval −0.7% to 7.3%). For the other scenarios, the intention-to-treat analyses showed similar participation differences as in the per protocol analyses. Table 3 and supplementary figure 11 show that, on average, the relative participation rate was 1.87 times (95% confidence interval 1.43 to 2.44) and 2.33 times (1.86 to 2.91) higher in the self sampling arm versus the control arm of the trials with a mail-to-all scenario, in the per protocol and intention-to-treat analyses, respectively. In the per protocol analysis of the trials with opt-in scenarios, the average relative participation was lower in the self sampling versus the control arm, although not significantly (0.73, 95% confidence interval 0.51 to 1.04), whereas on average in the intention-to-treat analysis, the pooled relative participation exceeded unity, although not significantly (1.22, 0.93 to 1.61). The relative participation was on average twice as high in the self sampling versus the control arms in the community campaign and door-to-door scenarios. We found five studies that provided response rates in both trial arms stratified by categories defined on the screening history status.2665103113114 Since the categorization was different throughout studies, subgroup meta-analysis or meta-regressions were not possible and, therefore, we analyzed participation rates and relative participation separately for the trials with stratified data (supplementary table 16). We observed that participation rates decreased generally with length of time since last screening in both trial arms. The lowest rates were in women with no screening records except for one study.65 However, the relative participation tended to increase with time since last screening, not taking the women with no screening records into account. We did not find evidence of publication bias in the mail-to-all or opt-in scenarios for relative participation (supplementary table 17). Sixteen of the trials reported on the adequacy of self collected samples. Table 4 and supplementary figure 12 show that, on average, 0.7% of self samples (95% confidence interval 0.4% to 1.0%, range 0.0% to 2.7%, I2=77.5%) were unsatisfactory for hrHPV testing. The hrHPV test positivity varied between 6.0% and 29.4%. The hrHPV positivity rate, pooled from 22 trials, was 11.1% (95% confidence interval 9.8% to 12.4%, I2=92.2%) (table 4 and supplementary fig 14). In 20 trials in which adherence to follow-up among women with self samples that tested positive for hrHPV was reported, on average, 80.6% (95% confidence interval 67.0% to 91.5%, range 41% to 100%, I2=98.7%) had a follow-up examination. The rate of adherence to follow-up varied by applied triage policy, with higher adherence in studies with direct referral compared with studies with a triage policy (supplementary fig 14). The adherence to follow-up was lower in women who tested positive for hrHPV in the self sampling arm versus women in the control arm, but the difference was not significant in 10 trials in which the follow-up adherence was reported in both arms (relative proportion of 0.91, 95% confidence interval 0.80 to 1.04; proportion difference of −4.8%, 95% confidence interval −13.1% to 3.5%). The CIN2+ detection rate in the self sampling arm varied between 0 to 11 per 1000 invited women (supplementary fig 15). On average, the detection rate was 2.28 times (95% confidence interval 1.44 to 3.61, I2=41.4%) higher in the self sampling arm versus the control arm. The detection rate ratio varied by triage policy, with a greater detection rate ratio (P=0.031) when women with a self sample that tested positive for hrHPV were directly referred to colposcopy (relative detection for the self sampling v control arm of 3.03 v 1.79; supplementary fig 16). The detection rate per 1000 screened women varied between 0 and 35. On average, the detection of CIN2+ per number of screened women was similar in the two trial arms (relative proportion 1.13, 95% confidence interval 0.63 to 2.04, range 0.05-4.31, I2=64.8%; table 4 and supplementary fig 17). No detection rate heterogeneity by self sample triage strategy was observed. Mailing self sampling kits to women’s home address is more effective in reaching populations that are underscreened compared with sending invitation or reminder letters for clinician sampling. The size of effect is highly variable among the included trials. Therefore, we recommend the set up of local trials to assess feasibility, effectiveness, and cost effectiveness before rolling out programs that include self sampling at regional or national levels. The proportion of hrHPV tests applied on inadequate self samples in participation studies was low, showing that this sampling method is suitable for hrHPV testing. The adherence to follow-up among women with a self sample that tested positive for hrHPV was remarkably high (81% on average), probably owing to measures foreseen in the randomized clinical trials. It remains to be elucidated whether these high adherence rates observed in trials could be reproduced in routine screening programmes, in which resources to maximize follow-up are more limited. A limitation, inherent among meta-analyses based on aggregated results extracted from published reports, is the lack of detailed data equally stratified according to potentially influencing factors related to the target population. A meta-regression, including only eight studies, did not reveal age effects. An Italian study showed a greater participation difference (self sampling arm minus the control arm of 11% to 12%) in urban than in rural areas (participation difference of 3%, with zero included in the confidence interval).104 Certain studies observed a lower response to the offer of a self sampling kit in more socially deprived groups,128 whereas others did not observe a social gradient.65114 Several trials reported lower response rates in the self sampling arm in women who were never screened than in women who had been screened,26114126 whereas others observed an opposite trend.65 Subgroup analyses and meta-regressions were not possible in the current systematic review because covariates were categorized differently. In order to evaluate the impact of influential factors more efficiently, we propose pooling individual patient data from the best trials. Future research could explore whether primary care providers could contribute to raising screening coverage. Primary care providers could verify the screening status of their patients belonging to the target screening population and offer self sampling kits to those who have not been screened recently.129130 Primary care providers could be an effective alternative in settings where mailing sampling kits as part of an organized screening program is not feasible and door-to-door invitation is too costly. Self sampling could also become the new paradigm for primary cervical cancer screening in the general population as an alternative for the collection of a clinician sample.131 This idea is currently being explored in the IMPROVE trial in the Netherlands.132 A more detailed list of study proposals on self sampling is included in the research agenda in the supplementary materials. For the first time, test accuracy of hrHPV screening and participation in programmes offering self sampling kits have been assessed in two joint reviews. This enabled simulating program sensitivity, determined as program participation multiplied by test sensitivity, as well as other parameters needed for cost effectiveness modeling. When adequate resources and infrastructure are available, a hrHPV assay based on polymerase chain reaction test should be used to achieve optimal program sensitivity. When funds are limited, using a less expensive hrHPV assay based on signal amplification could still provide an overall gain in program sensitivity despite the loss in test sensitivity. The highest participation rates in our systematic review were observed in studies that included door-to-door invitation scenarios conducted in Latin America or Africa. However, the direct offer of a self sampling kit by a health professional might also be an effective strategy to reach non-responders in countries with established screening programmes. Point-of-care hrHPV testing on self samples could also be appropriate in a context of providing preventive care to medically underserved communities. hrHPV testing with an appropriate assay offers a promising new strategy that could increase population coverage substantially. Whereas accuracy of new combinations of assays and self sampling devices can be evaluated in a diagnostic setting, acceptance and participation should be shown locally in a screening setting before general roll out. The Collaboration on Self-Sampling and HPV Testing group members: Mona Saraiya and Virginia Senkomago, Centers for Disease Control and Prevention; Francisco AR García, Pima County Department of Health; David Chelmow, Virginia Commonwealth University Medical Center; Alan Waxman, University of New Mexico Health Sciences Center; Julia C Gage, US National Cancer Institute; Nicolas Wentzensen, US National Cancer Institute; Christopher M Zahn, American College of Obstetricians and Gynecologists; Warner K Huh, University of Alabama at Birmingham; Jennifer S Smith, University of North Carolina at Chapel Hill; Thomas C Randall, Massachusetts General Hospital; Mark H Einstein, Rutgers New Jersey Medical School; Michael A Gold, Tulsa Cancer Institute; Kathleen M Schmeler, The University of Texas MD Anderson Cancer Center; Robert A Smith, American Cancer Society; Sarah Temin, American Society of Clinical Oncology; Jose Jeronimo, Global Coalition Against Cervical Cancer; and Philip E Castle, Albert Einstein School of Medicine. Contributors: MA designed the study concept and protocol. MA and PC formulated the clinical questions and the definition of PICOS components. MA elaborated data extraction forms for the review update. MA, SBS, ST, and FS extracted data. MA conducted the statistical analysis. MA, SS, and PC wrote the manuscript. SBS, ST, FS, and PC conducted a critical revision of the manuscript. MA, SBS, and PC revised and approved the manuscript before submission. Members of the Collaboration on Self sampling and HPV Testing (MS, VS, DC, AW, JG, NW, CMZ, JJ, FARG, WKH, JSS, TCR, MHE, KMS, RAS, and MAG) provided feedback on the study protocol, performed and verified the initial part of study selection, and reviewed the manuscript. All authors had full access to the data in the study and can take responsibility for the integrity of the data and the accuracy of the data analysis. MA is the guarantor. The corresponding author attests that all listed authors meet authorship criteria and that no others meeting the criteria have been omitted. Funding: This systematic review was supported by Global Coalition Against Cervical Cancer (New York, NY, USA) through a grant by the US Centers for Disease Control and Prevention through its cooperative agreement with the National Network of Public Health Institutes and subaward to GC3, and by High Authority for Health (Paris, France). MA was supported by the COHEAHR Network (grant No 603019), funded by the 7th Framework Programme of DG Research and Innovation, European Commission (Brussels, Belgium) and the German Guideline Program in Oncology (GGPO, Hannover, Germany). The funder had no role in the study design, data collection, data interpretation, or writing of the report. Competing interests: All authors have completed the ICMJE uniform disclosure form at www.icmje.org/coi_disclosure.pdf and declare: MA is principal investigator of the VALGENT (Validation of HPV GENotyping Test) and VALHUDES (VALidation of HUman papillomavirus assays and collection DEvices for HPV testing on Self samples and urine samples) framework. Both protocols provide a template for HPV test comparison and validation on clinician samples and self samples, respectively. Manufacturers of HPV assays and devices for self collection can participate, under the condition of provision of test kits and funding for laboratory testing and statistical analyses to the employing institutions. Researchers did not receive any personal funding. SS was supported in part by unrestricted educational grants to the Global Coalition Against Cervical Cancer from Rovers, BD, QIAGEN, and Roche; a contract from Chengdu Genegle Biotechnology Co, Ltd; and has received cervical screening tests and diagnostics at a reduced or no cost for research from BD, Hologic, Rovers, Arbor Vita Corp, and Trovagene. PC has received cervical screening tests and diagnostics at a reduced or no cost for research from Roche, BD, Cepheid, and Arbor Vita Corporation. Patient consent: Patient consent not required. The manuscript's guarantor (MA) affirms that the manuscript is an honest, accurate, and transparent account of the study being reported; that no important aspects of the study have been omitted; and that any discrepancies from the study as planned have been explained.
. Cervix Cancer Screening. IARC Handbooks of Cancer Prevention. Vol. 10IARCPress, 2005.
. HPV Self-Sampling for Primary Cervical Cancer Screening: A Review of Diagnostic Test Accuracy and Clinical Evidence. Canadian Agency for Drugs and Technologies in Health, 2018.
. Preferred reporting items for systematic reviews and meta-analyses: the PRISMA statement. Ann Intern Med2009; 151:264-9.
. Cochrane Handbook for Systematic Reviews of Diagnostic Test Accuracy Version 1.0.0.The Cochrane Collaboration, 2013.
. metandi: Meta-analysis of diagnostic accuracy using hierarchical logistic regression. Stata J2009;9:211-29.
. 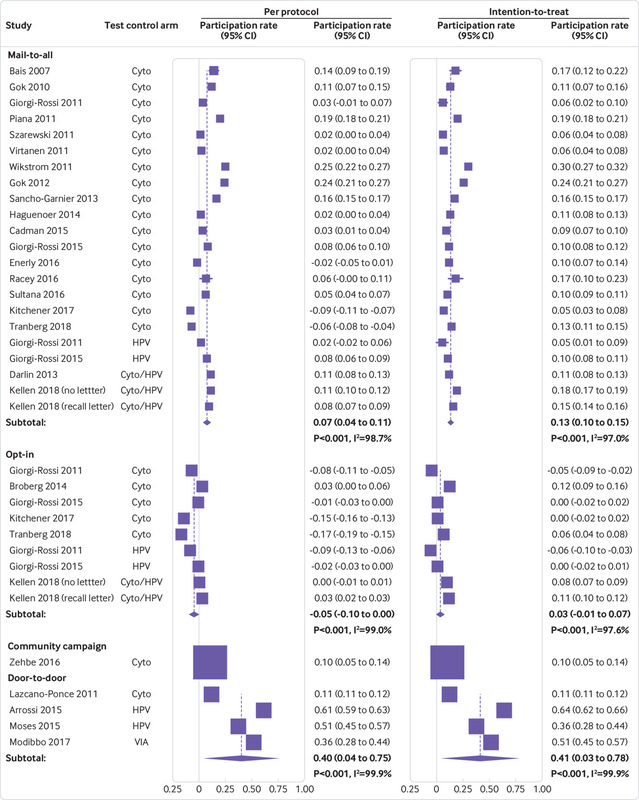 Updated tests for small-study effects in meta-analyses. Stata J2009;9:197-210.
. metan: fixed- and random-effects meta-analysis. Stata J2008;8:3-28.
. Meta-regression in Stata. Stata J2013;8:493-519. Polman NJ, Berkhof J. IMPROVE-study: Prospective randomized pilot implementation trial of HPV self-sampling in primary cervical screening. http://www.trialregister.nl/trialreg/admin/rctview.asp?TC=5078.